Renewable Energy Finance Forum (REFF)-Wall Street is one of the most well known forums and meeting place for financiers, investors and renewable energy project developers. 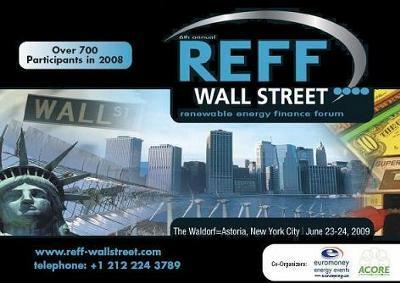 2009, REFF Wall Street will bring high profile industry leaders and big name Wall Street financiers. The conference will focus on the latest federal and state policy developments across the major renewable energy sectors. The speakers and forum chairs will elaborate on the sectors that will attract the most finance in this credit constrained economy in addition to carbon finance and policy forumulation. It will also review how the increasing involvement of big energy and agribusiness is likely to change the face of market with increasing consolidation, mergers and acquisitions, and a changing role for mainstream financers, VCs and private equity alike. There is also an early bird registration.